A few hours’ drive away from the hustle and bustle of Chiang Mai, is the serene region of Mae Hong Son. This northwesternmost province bordering Burma is like another world apart, hemmed in on all sides by high mountain ranges. Mist shrouded valleys, cascading waterfalls, hot springs and caves dot this region endless rolling mountains. It is also home to numerous hill-tribe villages and offer great off the beaten track adventure opportunities. Upon arrival at Chiang Mai International Airport, you will be picked up by our friendly guide to Pai (approx. 3 hrs. drive). Along the way you will visit the Memorial Bridge – an antiquated iron-wooden bridge originally built by the Japanese during World War II and the famous Yellow House an English cottage style mansion made famous by a Thai movie called Pai in Love. *We recommend a flight arrival time no later than 1 pm. In the morning, you will go for a 2-3 hours hike through the Pai Canyon described in some guide books to be Thailand’s answer to the Grand Canyon. Pai Canyon is a unique geological landmass of eroded red sandstone with deep gullies and ochre-coloured sharp ridges dotted with pine forests. The steep 50 m drops on either side of the canyon and the unparalleled view over the surrounding countryside are impressive. After your morning work out, you will enjoy a good lunch at Pai Land Spilt – an interesting giant chasm created by an earthquake in 2008. After lunch, you will visit Pam Bok Waterfall a secluded and beautiful waterfall surrounded by high cliffs. Thereafter you will proceed to one of the hot springs for a relaxing dip to soothe your aching muscles. In the evening, you will drive to Wat Phra That Mae Yen (Temple on the Hill) for a beautiful sunset over the far mountains. After an early breakfast, you will set off towards the Thai-Burma border to visit Ban Rak Thai (approx. 3 hrs. drive). Along the way, you will stop at the famous Kiew Lom Viewpoint for a 360 degree panorama view of Mae Hong Son mountainous terrain. Ban Rak Thai (literally “the Thai-loving village) also known as Mae Aw is an interesting Chinese village settled by former Kuomintang troops from China Yunnan province after the Communist takeover of China in 1949. The population is about 1000, mainly Chinese-born or Thai-born Chinese. Many signs are in Chinese and many of the inhabitants speak a heavily accented version of Mandarin. Other than trying out some Yunnan cuisine, you can also visit the tea plantation to learn about tea cultivation, harvesting and processing. Next you will travel south to Pang Ung (aka “Switzerland of Thailand”) (approx. 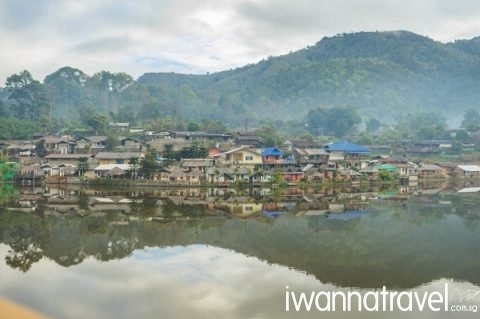 30 min drive) a Shan Minority Village with a tranquil lake surrounded by pine trees. You will also visit the impressive 10m high and 15m wide Pha Suea Waterfall whose water originated from the Sa Nga River in Myanmar. Check into your hotel in Mae Hong Son and enjoy a nice dinner by the beautiful Jong Kham Lake. *The best season to visit Pang Ung is during the winter month between November to February. Outside this period, you can visit the Su Tong Pae Bridge – an interesting 500m long bamboo bridge built above a padi field. Free and way at your own leisure till transfer to airport for your flight home (approx. 5 hrs. drive). There will be lunch stop en-route to airport. *We recommend a flight departure time after 4pm. If you are interested in hill tribe culture, we can also organise a 2D1N Hill Tribe Homestay Program. This can be arranged from Day 04 onward. We decided for iwannatravel after contacting a few agencies. Ying had been very responsive, patient and flexible in providing our customized itinerary. It would have taken us much effort and headache if were to plan this ourselves. Activities were well planned and spaced out unlike the hectic and fast paced group tours which we undertook in the past. The tour guide ( was very knowledgeable of the sites visited and importantly he was very humorous and kept us entertained and informed throughout the trip. Highly efficient from start to end. Bob was recommended to me through my cousin. He was always on the ball before, during and even after the trip; soliciting feedback from us to improve on her offering. She was also very understanding to our cost concerns; revising the itinerary a few times so as to meet our budget. Our guide was very professional; he was always doing his best to accommodate our needs and flexible with our request. Our driver was very careful with his driving and extremely thoughtful about the air-con temperature and toilet break. 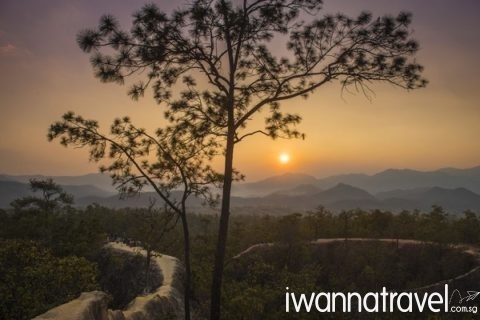 We strongly recommend you to book your adventure through iwannatravel. Thank you iwannatravel. 加油! Guide could communicate well and was very personable. Itinerary was flexible. Enjoyed being in a non tourist area to visit the long house village. Guide even went marketing for us! E.g chose fruit for us.